Discoveries at the ancient Maya site of El Pilar may portend a new model for doing archaeology and set a standard for sustainability for the world. Archaeologists and other research scientists and academicians have been eagerly engaged in uncovering the secrets that may, at least in part, explain how ancient densely populated Maya cities and communities sustained their monumental centers and large settlements in their seemingly inhospitable jungle environments. Their work goes far beyond developing answers to this question, however. The research portends the development of a whole new paradigm for archaeological investigations and conservation, and may suggest a useful new model for global sustainability. Anabel Ford welcomes visitors to the Tzu'un Maya house and forest garden. Photo courtesy Adalaide Sadler, El Pilar Project. 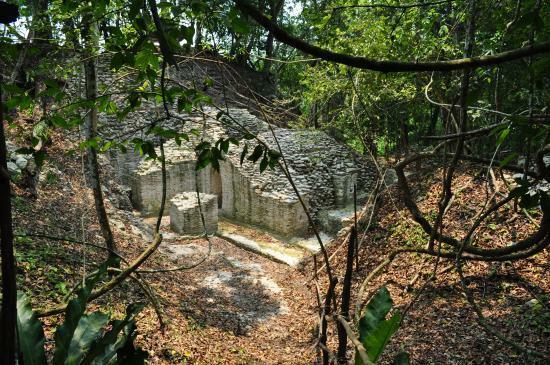 The site of the investigations is a large Maya monumental center called El Pilar, Spanish for "watering basin" because of the plentiful water resources in the area. Straddling the border of Belize and Guatemala, 12 kilometers north of the Belizean town of San Ignacio, it boasts approximately 100 acres of plazas (more than 25), temples, palaces, residential structures, and causeways, ranking it easily among the major Maya centers of the ancient Lowland Maya. It contained a population at its height of more than 20,000 people and a history spanning a period of 1,800 years, from 800 BCE to 1,000 CE. What makes it different from the other major and perhaps better-known monumental centers such as Tikal, Palenque, and Chichén Itzá, however, is its trademark jungle shroud, leaving most of its structures purposefully encased in the vegetative overgrowth that marked its appearance when first discovered in the 1970's. El Pilar is the focus of an archaeological investigative and conservation approach called "Archaeology Under the Canopy", a strategy for exploration, study and presentation that is designed to ensure the preservation of ancient structures in their natural "found" state even while work continues to uncover the mysteries that lie beneath and around. Plaza Jobo of the restricted northern H'Mena acropolis at El Pilar. Courtesy Adalaide Sadler, El Pilar Project. Says Anabel Ford, Director of the Mesoamerican Research Center at University of California, Santa Barbara, and a long-time key visionary and expert on El Pilar programs and research: "The very recent discovery of El Pilar offers the opportunity to pursue a different kind of conservation strategy called Archaeology Under the Canopy, where the natural forest and surrounding environment of the monuments are maintained to protect the site's fragile structures from the elements. Living biofilms attack the limestone where exposed, which rapidly deteriorates the vulnerable limestone facades. It is tree cover that reduces exposure to sunshine and rain and maintains an even temperature that will preserve the monuments." A goal of the approach is to ensure that the visiting public and others experience a more truthful and genuine encounter with the excitement of discovery most often reserved for the original explorers and scientists who first come across ancient Maya sites. 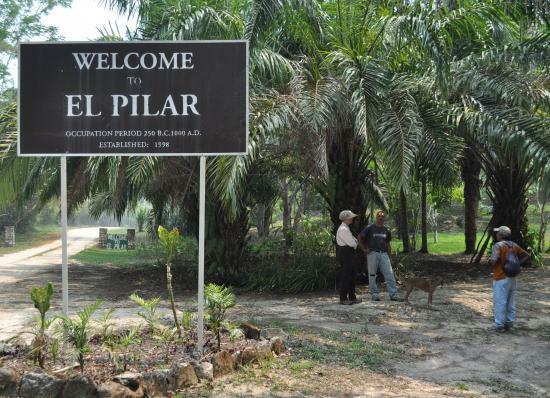 (See Xikna, the eastern temple of Plaza Copal, right, still appearing much as it did when first discovered at El Pilar). "El Pilar is a place of introspection and reflection," says Ford. "Gently shaded by forest canopy and full of a palpable mystery that evokes its enigmatic past, it demonstrates an authentic archaeological discovery rather than a naked city." More important than the glamour and sensation that accompanies the discovery and exposure of great pyramids, temples, palaces and ball courts, scientists at El Pilar are focusing on the traditional ancient agricultural practices and life-ways of the common masses who provided the supporting foundation for the kingships and ruling aristocracy that the popular press and literature have so often highlighted. They are exploring the practices and traditions that, according to their findings, had built and sustained the Maya civilization for centuries and, by extension, the abandonment of which would have led to their decline, with implications for environmental management today. 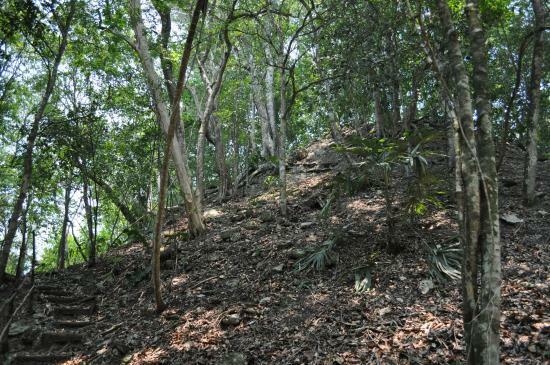 According to Ford, no practice was more critical to this than the widespread use of a landscape management system called the "Maya Forest Garden", based on findings that showed that the landscapes within the immediate vicinity of Maya settlements were composed of a systematically managed biosphere of plants and animals that had significant subsistence and economic value to sustaining an expanding population. "Extensive evidence exists on the management of forest resources, the flora and fauna, and the subtleties of Maya ecological knowledge," maintains Ford. "Traditional [Maya] practices of forest gardening support a model of long-term, sustainable management of natural resources by the Maya. This view acknowledges the Maya as managers rather than as destroyers. The research that underlies the principles of archaeology practiced at El Pilar is based upon the premise that the ancient Maya worked with their tropical environment, as opposed to transfiguring it, and by doing so created a flourishing civilization sustained by the natural rainforest ecosystem." 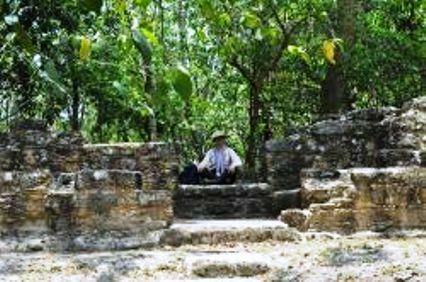 Ford and others have taken steps to present their findings by establishing, in conjunction with the objectives, planning and efforts of the Belizean and Guatemalan governments and local community resources, an organizational infrastructure supporting the promotion and preservation of the Maya forest, forest garden, the archaeological resources of El Pilar, and the related ancient Maya community traditions. This institutional framework has been instrumental in the ongoing development of the "El Pilar Archaeological Reserve for May Flora and Fauna", the park that contains the archaeological remains of El Pilar and its surrounding natural environment. Here, modern Maya Forest Gardens and other partially and fully exposed architectural features demonstrate, collectively as a living museum, the ancient Maya life-ways for visiting scholars and the public. Pathways navigable by visitors wind around impressive monumental structures and features, most of which are still enshrouded in the protective tropical vegetation. One ancient house structure has been completely excavated so that visitors can enjoy a full view of an example of residential construction within its Forest Garden context. Visitors are introduced to little-known plants that populated the Forest Garden, plants that played a critical role in sustaining the households and communities that constituted the foundation of ancient Maya society. The work at El Pilar addresses issues beyond those related to archaeology, cultural resources and conservation. The site crosses the border between Belize and Guatemala, two countries that have a history of differences. Program planners and managers hope that the development of the reserve, through cooperative efforts between the two countries, will create an effective "peace park" that will facilitate a better understanding between the two countries and promote common interests for a peaceful coexistence. Moreover, continuing investigations and site development are said to hold promise for boosting the local economies and communities associated with the reserve area by providing new opportunities for the people of both countries. Entrance to El Pilar. Photo courtesy Adalaide Sadler, Pilar Project. "Tourism is the only product where the consumer must journey to the source to appreciate it," says Ford, "and the most recent statistics demonstrate that tourism accounts for a growing proportion of income in the Central American Region. The model of Archaeology Under the Canopy practiced at El Pilar has attracted local involvement, student class visits, regional university interns, international permaculture enthusiasts, and world-wide environmental educators. With effective models based on the inherent value of a traditional people's conservation strategies like those of the Maya, we see increasing acknowledgement that the preservation of living cultures and regional economic development are mutually dependent elements of sustainability. Cultural heritage is thus an asset that is indispensable to the achievement of a sustainable future."